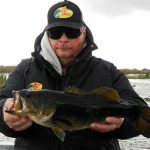 www.okeechobeejust4bass.com was working for Fast Break Bait & Tackle today. It is warming up…the water temp in the afternoon was 65 degrees and every thing is moving around. Today I had the pleasure of fishing with Danny Johnson. Danny has cancer and only about 8 months to live. I was happy to share the day with him. We fished with both shiners and artificials for 6 hours. We caught 15 fish. Here is a picture of some of the fish we caught today.